I am not confused. It is not fall here nor most likely where you are either which is especially apparent if you are under five feet of snow. But who says that pumpkin anything must be reserved for Fall? We don’t reserve wonderful things like chocolate nor vanilla beans for one season. Yes, the argument perhaps is that pumpkins are not growing right now, and ideally we should use ingredients that grow locally and are fresh, but sometimes we just may happen to have a left over can (or 10…I stockpile) of organic pumpkin puree that needs to be used. As the bitter cold rain poured down this morning and I was sadly reminded that we are in the depths of winter, I was rudely awakened at 4:45 AM by my Golden Retriever, Sadie, and her visiting cousin,Chloe, a Terrier. They “nudged” me from my slumber with licks and random paws poking my stomach and I finally waved the white flag and crawled out of bed. Drowsily, I tiptoed down the stairs and, of course, wanted to bake. I mean who doesn’t want to bake at 5:00am? You don’t? Well then I won’t call or text you at that hour—unless I am REALLY bored. Ok? After my first exuberant gut reaction, I questioned if I “should” bake something with pumpkin in WINTER?! 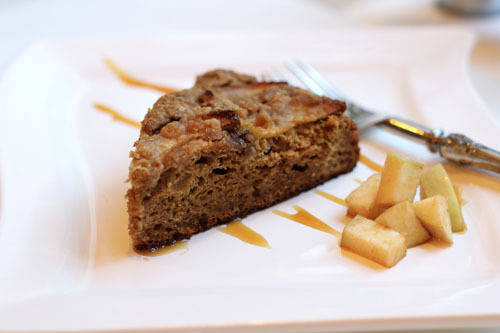 But then I came to my senses and adamantly decided to step out, waaaay out and take a walk on the wild side and whip up this autumn spiced pumpkin apple cake. It filled my house with the aromas of fall and while rain drenched my backyard and I cranked up the heater, I was reminded of gentler weather, bright orange leaves and fresh pumpkins sitting on my counter tops. And when I finally had a slice, oh heaven. It was pumpkin-y, spicy and spongy with a nice soft crumb and a slightly crispy brown sugar topping. If being great tasting isn’t enough for you, it also happens to be LOW-FAT, low in calories and high in the the good for you stuff that your body needs. So, if you are beaten down by winter’s freezing bite, wistfully dreaming of Fall and missing some of your favorite spices and flavors, go crazy, whip this up and step outside the box. Take a little walk with me on the wild side. I know you won’t be disappointed. —If you want other pumpkin recipes, try my citrus pumpkin bundt cake, these pumpkin cupcakes or my pumpkin whoopie pies! Low-Fat (3.8 g) , Low-Calorie (284) and Very Delicious! Inspired by Cooking Light but changed up quite a bit to Genify it. Makes 10 slices, one slice per serving. For the Topping: Crumble the three ingredients together in a small bowl with your hands until grainy with small pearls of the butter left clumped together. Set aside. For the cake: Preheat your oven to 350 degrees F. Spray a 9 or 10 inch round cake pan with nonstick cooking spray. In a medium bowl, beat together (with a whisk) the granulated sugar through the eggs. In a separate large mixing bowl, whisk together the flour through the salt. Pour liquid mixture into dry ingredients and stir together with rubber scraper (do not whisk any more…will form more gluten once liquids meets dry ingredients and will toughen your cake). Add yogurt and milk and stir until just combined. 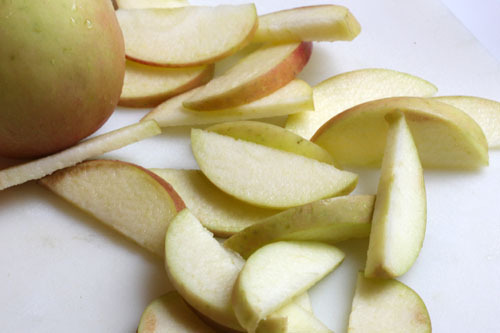 Slice up your apples with peel on in thin slices about 1/8 inch thick. Pour the batter into the prepared cake pan and top with the apples in a wheel patter (think spokes of a bicycle). See? Sprinkle crumb mixture evenly over the apples and bake for 50-60 minutes or until a toothpick comes out clean in the center. The toothpick test is important for this cake. It is a moist coffee type cake and the only way to tell if it’s cooked all the way through is with the toothpick test. Serve warm with coffee. It’s the best way to eat it. 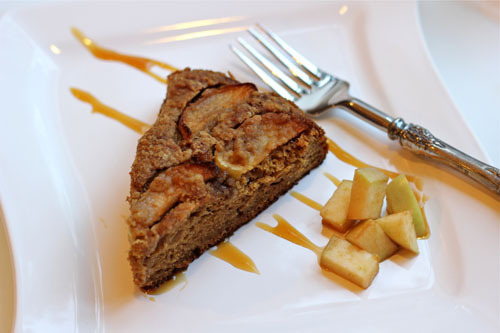 Categories: Cakes, Pumpkin | Tags: low-fat pumpkin coffee cake, pumpkin apple crumb cake, pumpkin crumby cake | Permalink. We eat pumpkin all year round (fresh which I cook down) – we don’t get it in a can here and I always have some ready in the freezer. This is an absolute must make – such a pity I don’t have any apple sauce on hand otherwise I would have made it this morning. The original recipe actually called for three Tablespoons of butter instead and I’m sure it would be just as wonderful. 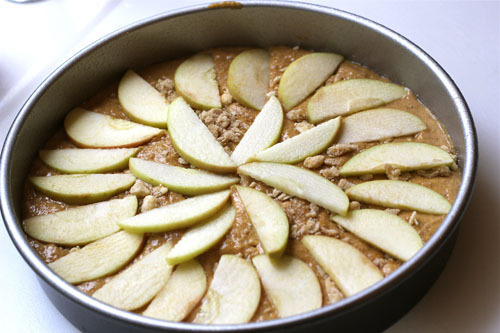 I am awed by the delicious combination of apple and pumpkin and have to make this cake today. What a gorgeous cake! I love the mix of flavors and would be tempted to bake it any time of the year. I can just imagine how wonderful it must’ve been to awaken to that aroma radiating from your kitchen! And then, to arrive at your kitchen’s door to see that beauty cooling on a counter top? Oh, baby! Do you need a boarder? I love that you ‘Geni-fied’ this cake! And you should’ve called me – I was up then with my youngest. He’s a morning person. I am not. (Is it bad I’m looking forward to the time when I complain about my boys sleeping in and not waking up?) Anyhow, a little fall thrown into winter is perfectly acceptable if it looks like that! I agree, it’s still perfect for pumpkins to me. This looks fantastic! I share your early morning baking!! What better time than first thing in the morning, when all is quiet and you can happily bake away!! In fact, I hate that week day “work” gets in my way; I’d rather be in my kitchen that in my office!! This sounds perfect with a morning cup of coffee, I think its a perfect comfort treat for the cold weather!! I am sure your family enjoyed waking up to the tantalising aromas of Fall this morning! Sounds delicious. That is one seriously good looking cake! I would love to sink my teeth into a slice. I have to check if I can still get pumpkin at the supermarket, they seem to disappear from the shelves here after Halloween and I’ve never really tried pumpkin in a sweet dessert, like a pie or anything. I LOVE simple cake like this one. Thanks for sharing! I can see how baking at 5am would be wonderful, I wish I was one of those people who woke early naturally (though, it sounds like Sadie lends quite a helping hand in your case). Quick question – how many serves (slices) is it to be 284 calories a serve? Hi Aimee! This cake makes 10 slices for the 284 calories. This looks like a wonderful cake. Love the pattern you made with the apple slices. Well this is just cruel…looks incredible! I’m with everyone else, there shouldn’t be a time limit on when we can and can’t eat pumpkin. I’m happy eating it throughout the year…all day, errryday. Great recipe!! This cake sounds delicious. It sort of reminds me of the apple cake my Grandma makes, except of course hers doesnt have pumpkin. This is officially on my must try list. Any day is a pumpkin day in my house. This looks delicious. Geni, this looks DIVINE! Canned goods change everything where “seasonal” and “local are concerned! I think pumpkin is acceptable year round- its so good for you! Full of all those orange vitamins! And not to mention delicious! Thanks so much for this beautiful recipe! In my opinion, pumpkin dessert eating should occur all year all day every day. So you have perfect timing. If you ask me. LOVING this cake! And what else is one supposed to do at 5AM other than bake? Sheesh! Yummy! Never too late for pumpkin… I bake with it throughout the year! And love it paired up with apple! I often get up at 4 am to take the dog out, but crawl right back to sleep. I guess I’m not as discipline as you. 🙂 The cake would be great with coffee, looks delicious and I love the apple topping. I could eat pumpkin year-round and this looks like a perfect way to do it! 5 in the morning? 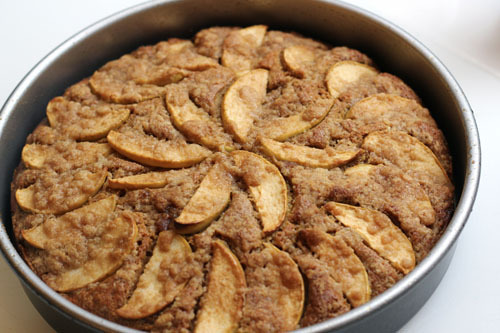 I am still on my second dream…but would love to wake up with this pumpkin/apple cake. Looks delicious and yes…I miss the spices. Your recipe sounds great. I agree that a good recipe can be made with what is available. In winter, you expect that you will not be cooking with totally fresh ingredients. Canned pumpkin is what most people use and I don’t think there is anything wrong with using it. I can’t wait to try your cake.